2010 was the International Year of Bio Diversity, and it was recognised as so successful and so important that the United Nations have decided that from 2011 to 2020 this will be the decade of Bio Diversity. So what exactly is Bio Diversity? It is the Great Circle of Life! That is why Old Macdonald’s Farm is fully supporting the United Nations Decade on Biodiversity with features and displays around the Farm that celebrate the breadth of nature. Visitors will know that we placed signs highlighting the trees and local wildlife as well as your farmyard favourites here and will be doing much more in future. The Singing Bullfrog Trio will tell you all about life in the Florida Everglades and how their habitats are threatened whilst the colourful boards all around their home, near the rabbits, explains why frogs and amphibians are so important as what is known as “indicator species” that show dangers to the environment. Then in Old Macdonald’s Trouble with the Truck you will learn about the importance of recycling and also read about climate change that is threatening many species. Old Macdonald is very keen that all visitors have a great time when they visit his farm, but also that he encourages everyone to think about the world in which they live and how they can help to protect it. 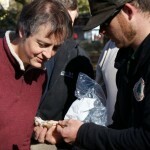 That is why he is proud to be a member of the Decade of Biodiversity Campaign. To find out more about Bio Diversity, and so he did not need to pay me, Old Macdonald gave me a day off recently and I visited the Natural History Museum in London to find out more. What a fantastic and exciting place that is now, and completely free of charge so Old Macdonald reckons you can visit his farm, spend your money on his “Make an old farmer happy” campaign as well as donating to our four fabulous charities, and then take the family to South Kensington using an off peak travel card on the District or Piccadilly Lines, and have a great free day out. I have not been there for years and the layout of this magnificent Victorian Building has changed beyond all recognition since I was a boy. Mind you, it probably was not even built when Old Macdonald was a lad. Whilst there you must check out the Dinosaur Hall and your mind will be blown and your wits shaken by the realistic Tyrannosaurus Rex you will find lurking round a corner in the gallery, visit the Mammal Hall, check out Chi Chi who some of our older readers will remember, and enjoy the interactive displays teaching you so much about natural life in Britain and the World. The staff are most helpful and enthusiastic and with access to computer screens as well as historic books for the real enthusiast this is a must visit place. Also, by tracking insects, birds, flowers and plants in Britain you will help the Bio Diversity Section trace Britain’s changing wildlife. Visit www.biodiversityislife.net to find out more. Plus think about the importance of planting British traditional plants and trees in your gardens so our insects can feed on them, and then in turn the birds can feed off the insects! For those of you with a passion and interest in this, there is a special conference from 13th to 15th September at Beale Park to look at British wildlife and if you want to go along do let us know. You can meet experts and talk to them. Just email us at info@omdfarm.co.uk and we will arrange for you to go along. This is the first in a series of articles that Old Macdonald is going to write for you on your favourites here at the Farm so you can learn a little more about them. We hope you enjoy this information and understand that each and every animal on this earth has a story to tell and an importance in the great Circle of Life! First, alphabetically and because Old Mac loves them so much, are the amazing Alpacas. Alpacas are related to Llamas but much smaller and also have never, ever been used as Pack Animals (to carry things). They are used for wool and their wool is not only warmer than that of a sheep but comes in 22 different colours. They do not live in the wild but in enclosures like farm animals. They do get wild if you do not feed them though! They were very important to the Incas of Peru and according to legend, the beautiful and intelligent Alpaca was created by Inti, the Sun God, as a reward to the Inca people. They were also thought to be linked to the goddess ‘Pachmana’ or Earth Mother. Therefore they have been important to the economy and lives of people for over 6000 years; quite a good record. So while their cousins the Llamas were being made to carry heavy goods up and down the mountains, the Alpacas were sitting around looking pretty, being worshipped and having their hair cut. Just like TOWIE then! Their Latin name is Vicugna Pacos. Why do they have a Latin name I wonder? 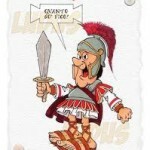 The Romans never met them! When the Spanish arrived in South American in the 16th Century they brought sheep with them which they put to graze in the same areas that the Alpacas needed so whilst there were perhaps 30 million Alpacas when they landed, less than 100 years later they were nearly extinct as all their grass had gone and they had been driven away. Those remaining lived on mountains and survived growing hardier then regained their popularity and importance for the native South American people and began to grow in numbers once more. 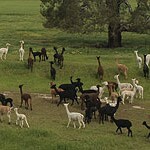 Now Alpacas are spread over large parts of the continent and are numbered in millions once more. So therefore conservation is not something new but has been important for centuries. They were brought to Britain in the 19th Century and Queen Victoria had clothes made from Alpaca wool. Farmers also found that they were very good at scaring foxes away from sheep herds so they are very useful too. One of the strangest things about these interesting animals is that all the Alpacas in a field will go to the toilet in exactly the same place all the time, a bit like cats using a cat litter basket or us queuing up for the toilets! They are very clean animals and we cannot think of any other animal here at the farm who does that, apart from you and our cats of course! So when you feed the Alpacas you are touching 6000 years of history, giving grub to an Inca god, linking to the Spanish Conquistadors, Queen Victoria and the citizens of South America. They are lovely animals, very friendly too and will be delighted to see you. Unless you happen to be a fox! So now you have learnt a little more about these wonderful animals and Old Macdonald will add more information for you during the year to make sure that you enjoy your visit to his farm even more, if that is possible! 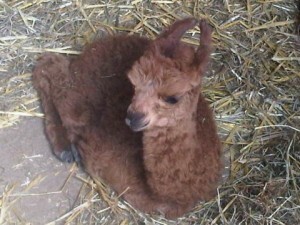 On 9.7.11, keepers were delighted to announce the news of yet another new arrival at the farm; a baby boy Alpaca (or Cria). Mother (Eloise) who is similar in colour to the Cria are doing magnificently well, however our little bundle of joy is yet to have a name! Again we are giving our Facebook friends the chance to come up with some great ideas. In return the winner who picks the best name will win a family day out. Winners will be announced in the next few weeks, so keep posted!